German PC gamers looking to import the non-censored Call of Duty: Black Ops from elsewhere in the EU may be out of luck. Earlier this month, we learned that Call of Duty: Black Ops would be censored for its German release. I suggested that German gamers who really wanted to play the game as intended could simply import from one of the other countries in the EU. Unfortunately, it seems like German gamers looking to pick up the uncensored PC version of the title are out of luck. According to PC Games.de, Steam will refuse to recognize and authenticate the installation of any version of Call of Duty: Black Ops except the localized (and censored) German one. Given that a Steam authorization is required for every install of the game - even physical, boxed copies - this effectively means that German PC gamers must either settle for a censored experience, or work around the Steam requirement via less-legal methods. 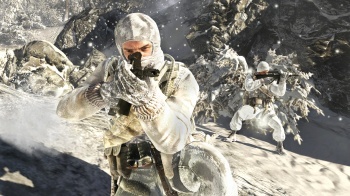 German gamers looking to buy Black Ops on Xbox 360 or PS3, meanwhile, will likely face no such restrictions on importing the title. Sure, the game might not be in German, but that's the EU where everyone speaks like five languages, right? You'll be just fine. Content removed from the German Black Ops includes: scenes of gratuitous violence and torture in the campaign, the ability for explosions to blow characters' limbs off, and - for whatever reason - the Rolling Stones' "Sympathy for the Devil" from the soundtrack.